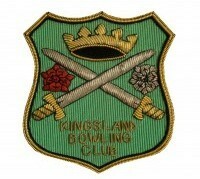 Kingsland Bowling Club was formed originally in October 1976 when fourteen enthusiasts agreed to seek out a suitable site in the village for a bowling green. After a sustained effort involving careful planning, generous voluntary work and praiseworthy fund-raising efforts, a Clubhouse was located in a redundant classroom at the school. The Club then celebrated the opening of its first bowling green in May 1980. On-going efforts resulted in the development of fixtures with other bowling clubs. The Club Badge was also adopted – its design recognises the nearby “Battle of Mortimer’s Cross” between the houses of York and Lancaster. Over subsequent seasons the Club grew in popularity. The combination of a clear strategic vision and members’ determination to develop the Club, resulted in the provision of a first-class green and a superb purpose-built Clubhouse. These facilities were opened officially in June 1996. The groundsman’s store was completed just over a year later. By this time the Club had grown to a total of 140 members, including 57 social members. As a result of the efforts that have been made over the years, current members can now enjoy competing in a full fixture list of matches with other clubs, playing in a variety of internal club competitions, or simply having a casual “roll-up” in a wonderful setting. The Club continues its proud tradition of producing bowlers who perform both at county and national level. It hosts area tournaments and welcomes visiting tourist teams. In addition, the Club arranges entertaining social activities during the winter months. Kingsland Bowling Club’s ambition to enhance provision has gone from strength to strength. A grass-surfaced car park for members and their visitors, which is located on the Glebeland adjacent to the Clubhouse, is the most recent project to be undertaken. Today, as the original Founder Members intended, the Club continues to welcome new recruits who wish to enjoy the game of bowls in the 21st Century.